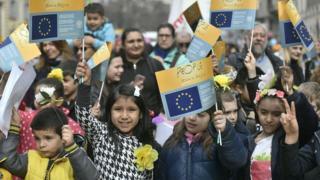 Home / Europe / Milan anti-racism march draws "hundreds of thousands"
Milan anti-racism march draws "hundreds of thousands"
Deputy prime minister and League leader Matteo Salvini says the government’s new immigration policies will “make Italy safer”. Under the new governing coalition, Italy has tried to close its ports to boats with migrants travelling across the Mediterranean. Demonstrators marched under the slogan People First, with organisers issuing a mission statement saying diversity is a cultural treasure. “We want Italy and Europe to change their policies, to put people at the centre with their difficulties,” one man told Italian broadcaster Rai TV. A woman said the march was to show that “reception is a very beautiful thing and diversity an enrichment”. Milan’s social democrat mayor, Beppe Sala, described the protests as a watershed moment.